If you would like to set a standard font stack, or use a font face that has already been loaded on your site via other means (like @font-face), this is the best way to set that font family for your menu. This setting is available in the Fonts section of the Customizer. Please note this is the font property, so you need to include font size and font family. You’ll only want to use this setting if you want the same font family, font size, and font weight across the entire menu. If you want to add a Google font that does not appear in the list, you can do so programmatically with a filter in your child theme’s functions.php file. This font will then become selectable in the Google Fonts list in the Control Panel and Customizer. 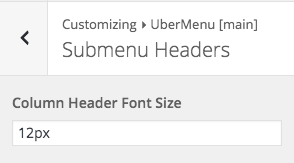 You can change the font size of each type of menu item (Top Level, Column Header, Normal Item) independently in the UberMenu settings. The easiest way is to use the Customizer, where you can preview your changes. Let’s say you wanted to use a different font in the menu bar than the submenu. You could write some custom CSS to accomplish this. The simplest way would likely be to use the font settings to set a global font for the menu, and then override that with custom CSS just for the top level. But this CSS will create two styles – one for the top level, one for the submenu – for demonstration purposes. In this example, we set Raleway as the font for the top level, and Droid Serif as the font for the submenu. Please note that you need to make sure you are loading the proper font assets if you are trying to load Google Fonts or a hosted @font-face.